How much hair do you need? Against common belief I do not need a lot of your hair to make these two braided circles. Around 700 strands of hair are enough to get you there. But how much are 700 strands? I used to say it's about as much hair as you lose in 1 day but it turned out that that's not true. You lose about 100-150 strands of hair a day. It therefore is as much hair as you loose in a week but believe me no one will notice. Ask your hair dresser or a crafty friend to assist you with collecting the hair. I have one important note that is so important that I will write it in all caps. (Yes, its that important) PLEASE TIE THE HAIR TOGETHER AT THE ROOTS BEFORE PUTTING IT IN AN ENVELOPE! I want them to arrive in my studio all in order and not in a hair salad mess. That said, if you are in Berlin (or I happen to travel through your home town) I gladly assist you with this process myself. Now that you are set on the how much hair i need and how to collect it, I have to talk to you about the minimum length: 25cm are a good starting point, anything below get's tricky. I did some commissions where I used shorter hair as inlay along side with the silver wire, the soul of the circle, but 10cm are definitely too short for a braided circle. We can discuss other options though. My creative solutions never seem to cease. How much does this beauty cost? I'm glad you ask and happy to tell you that the price tag on this beautiful and completely handcrafted piece reads 289€ (plus shipping and customs duty). An alternative option to the oxidized or brushed silver version is a brass version which costs you 269€ and looks oh so pretty, especially if you prefer a warmer metal tone. Gold is definitely possible as well. If you are into it, blingbling, contact me and we set a price we both feel comfortable about. How is the process and how long does it take? 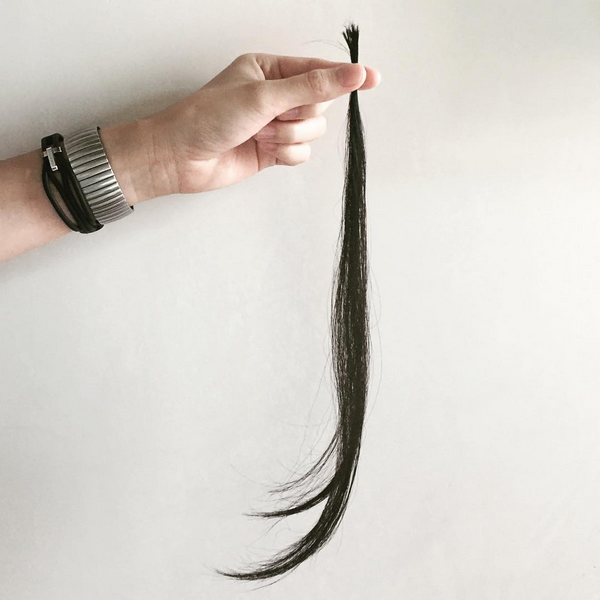 After you (or your hairdresser or your best friend or I) have cut off the #700strandsofhair I kindly ask you to wrap it in an envelope and send it to my studio in Berlin. Depending on my work load it takes between 2 and 4 weeks. I will give you a more detailed estimation once I have your hair in my hands. Can you use something else then hair? Okay, odd but fair question. In case you are not as big of a fan of hair as I am, I can tell you that I'm currently experimenting with a finely spun silk thread, called silk hair. I let you know how it turns out and then you can have your hairless Circle of Friends piece... but where is the fun in that? And no, no vegan version insight. I don't fancy plastic and it's endless iterations. I would love to experiment with synthetic spider silk though. If you get your hands on it, I'm in. That said homegrown hair by your friends and lovers is still my material of choice! If I left any questions you might have unanswered use the comment field below and I get back to you asap.